One of the most endearing qualities of Mother Goose rhymes is their overt humor. Characters fall down hills, bring farm animals to school, stick their thumbs into pastry products and leap over celestial objects. The situations are ridiculous, exaggerated and simply silly — just the kind of humor young kids love! Written for children reading at first and second grade levels, this readers theatre book uses the endearing Mother Goose rhymes as its basis, making it especially valuable to teachers and librarians working on building fluency skills in their beginning readers. Read more...This book is incredibly comprehensive, including presentation and instructional follow-up suggestions, staging diagrams that enable teachers to use each script with entire classrooms of students, a list of additional teaching resources for each play, and simultaneous Spanish translations for several plays — a real plus for ESL programs! 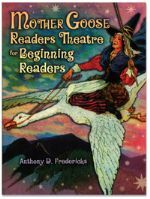 An introductory chapter discusses the educational value of using readers theatre with young readers and ESL students.